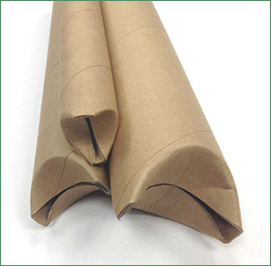 4" x 42" Crimped-End Kraft Tubes | Chicago Mailing Tube Co. Since 1902, Chicago Mailing Tube has fulfilled the personal, business, and industrial shipping needs of hundreds of thousands of people in the Chicago area. Whatever your shipping needs are, trust that we have the right shipping tubes, containers, and materials to help you mail any item or document safely and intact. We offer 4" x 42" self-locking kraft tubes so you can send anything across the city or country without worry. Additionally, we perform quality control tests to ensure that each of our 4" x 42" crimped-end kraft tubes meets our high standards and your high expectations for shipping tubes. We aim to provide you with excellent service-no order is too big or too small, and we can ship everything within 24 hours. Need to buy our shipping tubes in bulk? Take advantage of our wholesale options for any of our materials. Just call and tell us what you need and we'll be happy to provide. Fill out our online form to get a quote on our 4" x 42" self-locking, crimped-end kraft tubes. You can also call (312) 243- 6050 to reach us directly. We know how much you want to keep your shipped items secure and protected from damage. With self-locking, crimped ends, our tubes keep your products snug inside-and the cardboard is thick and sturdy to add an extra layer of protection. Whether you need to ship curtain rods, lighting kits, posters, or hardware, these tubes are the perfect option. Get in touch with us if you have any concerns.